Another day has passed since the legendary elevator ‘incident’ that took place between JayZ and Solange. After a few days of silence, the Carter family is now speaking out. Bey’s and Hov’s public relations team have released an official statement in regards to the ‘incident’. “As a result of the public release of the elevator security footage from Monday, May 5th, there has been a great deal of speculation about what triggered the unfortunate incident. But the most important thing is that our family has worked through it,” an exclusive statement to The Associated Press said Thursday. 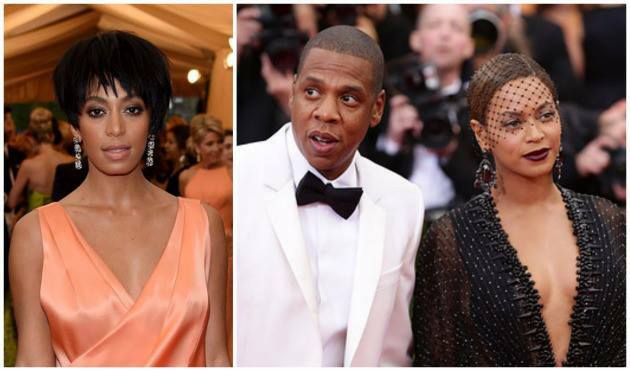 “Jay and Solange each assume their share of responsibility for what has occurred. They both acknowledge their role in this private matter that has played out in the public. They both have apologized to each other and we have moved forward as a united family. And there it is! One thing we do know is that something happened that resulted in that incident. Reports, indicated that JayZ was flirting with another woman and Solange was not having it. Solange, 27, unceremoniously told the designer that “anyone who gets close to Jay has to be warned and deal with her as a sister,” a source told Us Weekly. Roy, no pushover herself, didn’t back down when Solange told her she was “too close” to Jay Z, a source who was close to the spat said. This is juicy!!!! Hopefully, this is not something that has been going on for a while as far as JayZ disrespecting Beyonce and their marriage. Keep em in prayers. This entry was posted in SAY WORD! and tagged BEYONCE, JAYZ, RACHEL ROY, SOLANGE. Bookmark the permalink.